Paul Drechsler is passionate about supporting his community — be it through proper development or helping vulnerable children. The 36-year-old commercial lender for the Bank of the West is no stranger to Gresham, as it has been his home for most of his life. Drechsler grew up in the city, attending Gordon Russell Middle School and Barlow High School, is surrounded by family here, and is watching his own kids develop in the same community. 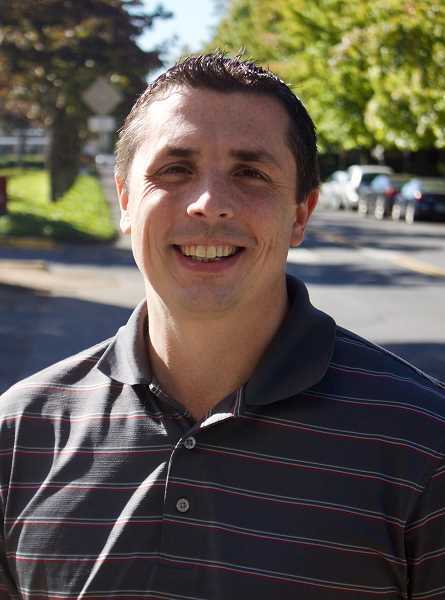 Now, Drechsler wants to represent his community by serving on Gresham City Council Position 4. Though he has no experience as an elected official, he has spent nearly a decade exploring the issues while serving on several committees. He is the chair of the Planning and Development Commission for the city of Gresham, chair of the Gresham Redevelopment Commission Budget and is on the Redevelopment Advisory Committee. PAUL DRECHSLER: I have been involved for a long time. Part of it was I wasn't sure if (incumbent Mario Palmero) was re-running, and looking at the field a couple of days before deadline, I felt we needed the expertise in development and someone who has been associated with the Rockwood neighborhood on council. OUTLOOK: What have you learned from the committees you have served on? DRECHSLER: My perception of Gresham comes from a development standpoint — land-use, code and policy. A lot of the issues go back to the structural development of Gresham. When you talk about the housing issue, it's an inventory issue. When landlords have 50 people lined up to rent an apartment, they are not going to lower their rents. They will be picky on who they put in and raise the rents. Our population continues to grow rapidly, and our development hasn't been able to catch up. Gresham is at a critical juxtaposition. We have the land and development is happening. We need to do a better job of planning and building the city we all want to live in. That is where I don't think we have the long-term vision. We are reactive, and not proactive. OUTLOOK: What are the issues you are focused on? DRECHSLER: My top two (are) housing and our foster system. Me and my wife are foster parents, and I want to use the platform to show that we are in a crisis right now. Literally minutes away there will be 3 and 4-year-old kids sleeping in a hotel because nobody will give them a bed to sleep in. Of all the problems we are talking about, we can solve that. We become foster parents a year and a half ago. My wife is a center director for a preschool. It was a little girl who came into the school who was in foster care at the time and didn't have a permanent solution. She was brought to us, and we have a son who is a little bit younger, but we said absolutely and opened our home. And she is our daughter now. We have a glut of kids coming into the foster system because of the opioid epidemic and other drug issues. While homelessness isn't a reason to take a kid away, it certainly doesn't help with safety and security. There are many environmental factors that have compounded our current crisis. We need more people to know that our foster system is in trouble, and the city can encourage people to get involved and open their homes. To make it easier, and support the Department of Human Services and create resources and avenues. I know foster families that have five or six kids, and they don't have any reprieve. Kids don't deserve this, they didn't do anything wrong. OUTLOOK: Would you change how the city or council functions? DRECHSLER: We miss a major opportunity in more community involvement. We are still trying to figure out the balance of getting our information out and creating more citizen involvement groups. These are some of the best assets in the city — smart people who want to create good solutions. We just have to be smarter and more creative with how we use them. DRECHSLER: I have been involved the longest. My commercial and economic mindset is what Gresham needs. We need to encourage economic development out here. We talk about all these services, but they all boil back to where the money is going to come from. Economic development builds sidewalks and parks. Focusing on development forms a snowball to pay for the resources we need for the city.